Prices vary by season and crop availability. Our new Oak Glen favorite: Strawberries! We started planting in 2008, and the popularity of our berry patch has just taken off! It’s now our earliest and longest running crop. Berry bushes in Oak Glen begin producing in early spring and keep bearing until the first pre-winter frost. They just might give apples a run for their money. We grow mainly Albion Strawberries (Fragaria ×. ananassa). They’re not one of the larger varieties, but they are very tasty. Pick a slightly tarter berry early in spring, or wait until summer when their sweetness really sets in. By August, we make shakes out of ’em for our kids at Day Camp. They love ’em, and needless to say, we think they’re something worth talking about! Our berries are doing well, so come on up and try some out. People from as far away as Orange and Los Angeles counties already do! Warning: we never know how many u-pick guests will arrive on any given day, so it’s first come, first picked. If you are in doubt about the status of the crop, please call first at 909-797-7534. 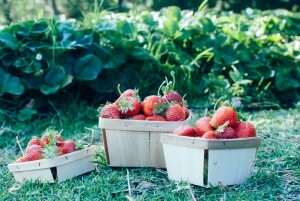 Strawberries are grown, of course, on the ground, so always wash your fruit first, before eating.